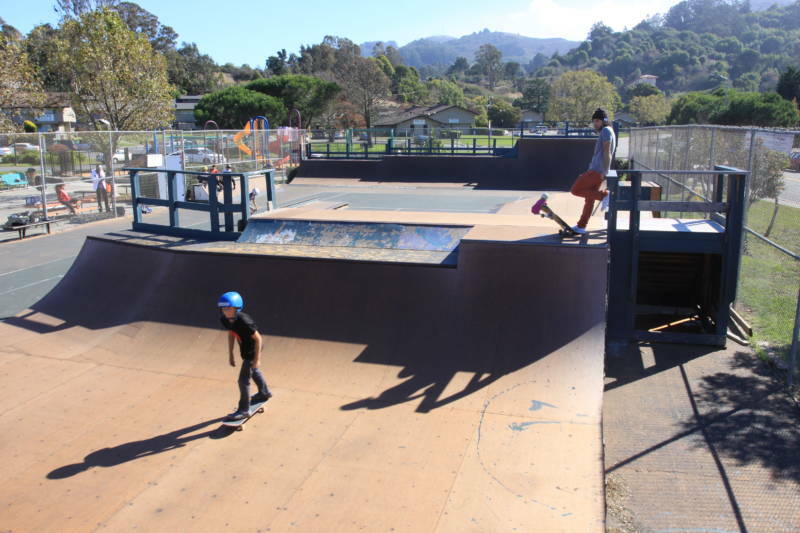 A skate park in Marin City is celebrating its reopening this weekend after being closed for most of the past two years. In 2014, a Kickstarter campaign raised funds to build wooden ramps and open a skateboard park on the site of old tennis courts, attracting skaters from throughout the area and even some tourists. The Marin City Community Service District paid for the required liability insurance when the park opened, but in 2016 the district said it could no longer pay the insurance bill, so the park closed. The site itself is on land owned by the Marin Housing Authority, which said it had no funds to cover the cost of insurance. Marin City is not incorporated and the county has not offered to chip in any funds either. That's where Proof Lab comes in. 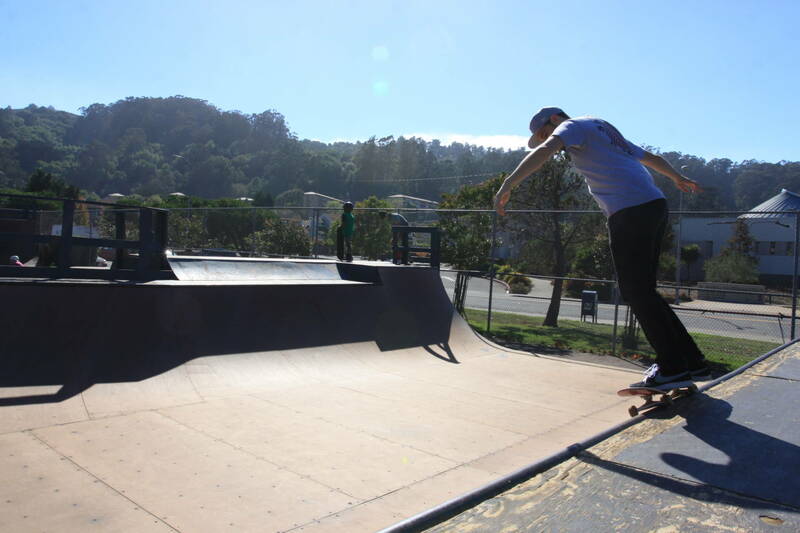 The skate and surf shop is located in nearby Mill Valley and funded an initial insurance payment, but park organizers will need to fundraise to keep it open long term. The park itself sits in a little valley of green trees and scattered low-rise apartment buildings. Kids from Mill Valley and other nearby affluent and predominantly white areas were regular visitors to the park when it was open. In contrast, Marin City has a median income around $40,000 and a poverty rate of around 30 percent. Demographically, it’s just over 50 percent black and Latino, according to census estimates, making it a lot more diverse and a lot lower income then the rest of Marin County. In many ways it doesn’t have the same resources as other parts of the county. Community leader Paul Austin has worked hard to get the skate park to reopen here. “I want kids in Marin City to have the same opportunities as kids in other parts of Marin County,” Austin said. Through Austin’s nonprofit Play Marin, he leads a wide array of youth programs in Marin City including sports, recreational activities and computer coding classes. Austin, along with the owner of Proof Lab, have been the major forces behind keeping the park open. Austin hopes to eventually showcase art in the skate park too. Austin also plans to fundraise to offer free weekly lessons and to help get skateboards to local kids who wouldn’t otherwise have access. “If you put a board in the kids’ hands, and say ‘here is something new, let’s see what you’re going to do,’ they’ll start skating,” he said. Among those who came for this weekend’s reopening were 12-year-old brothers from Mill Valley. Both said they were thrilled to be able to use the park again. “This is one of the best skate parks around," Adam said. “There’s all three types of skateboarding: flat ground, street and transition,” his brother Mason added. Austin said he loves that the park attracts a diverse cross-section of young people from throughout the area. “It will bring kids into Marin City, but it will also allow kids in Marin City to actually grow up skateboarding,” he said. Austin has volunteered to take the lead on fundraising efforts. They'll need to raise at least $10,000 per year to cover liability insurance for the park to stay open long term.